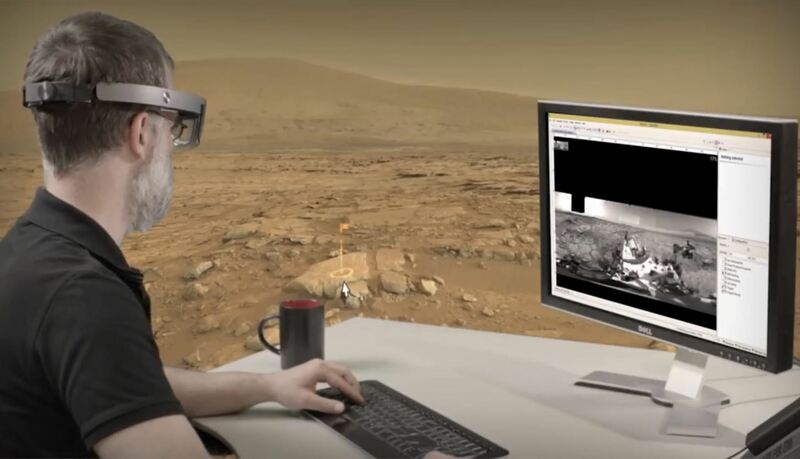 In a video published on Oct. 10 showcasing a collaboration between NASA JPL and Microsoft called OnSight, several scenes include a HoloLens that looks quite different than the current generation model. Developer Jasper Brekelmans noticed the slimmer, sleeker version and shared this observation on Twitter. 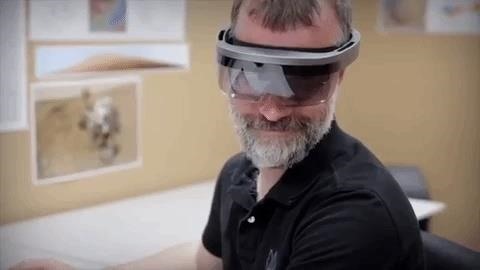 Compared with the dark grey current generation model, the HoloLens in the video sports a boxier design with a metallic silver finish, with sharper angles than the HoloLens's rounded appearance. The visor on this headset also appears to be smaller and more vertically oriented, less wedged shape of the current HoloLens. Lacking a banana for scale, the headset in the video looks to be smaller than the original as well. 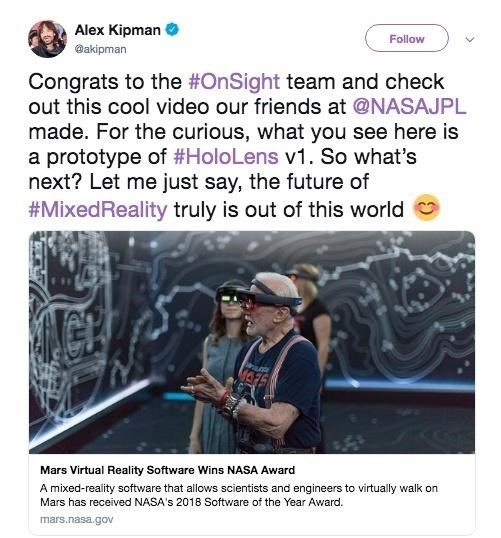 The video specifically was touting NASA JPL's OnSight project, which enables scientists to navigate the terrain of Mars in augmented reality using a HoloLens. A federally-funded research facility, the California Institute of Technology manages JPL for NASA. Using footage from NASA's Curiosity rover, the application renders a 3D model of the terrain that enables engineers and scientists — geologists, in particular — to view rocks, dunes, valleys, and other features from the face of the red planet. Users in different locations can collaborate in the experience, with avatars representing colleagues walking through the immersive 3D model. Winner of NASA's Software of the Year of the Year Award, the development team is working on a version of the app that will be available for the general public. In the meantime, the Access Mars webVR app from Google offers a similar experience. Based on previous reports, HoloLens 2 should arrive within the first quarter of 2019 at a lower price and lighter weight with a more comfortable fit. Microsoft has revealed that the device will include the new Project Kinect for Azure sensor that provides the greatly-improved spatial mapping. The custom silicon of its AI-powered Holographic Processing Unit will also be capable of dynamically-updating its neural network. The next edition is expected to have a larger field of view as well. We've reached out to Microsoft and JPL for comment to see if they can shed any light on these images. We're waiting to hear back. In the meantime, there's more evidence that this may be a prototype. Jonathan Dana in the HoloDevelopers Slack pointed out that it looks very similar to a prototype that Unity shared with Tech Crunch back in 2015. Finally, the mystery has been solved courtesy of Microsoft technical fellow Alex Kipman, who revealed on Twitter that the device depicted is, in fact, an early prototype.